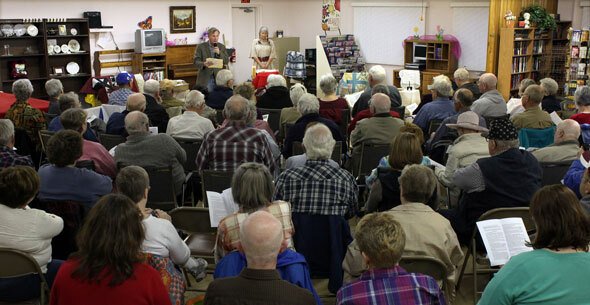 More than 70 people filled the front parlor of the Spearfish Senior Center this evening (4/2/13) to enjoy a well-done presentation of Dakota Daughters, an hour-long story of three women, three lives, and three stories -- intertwined with the horrific incident at Wounded Knee Creek. This was an exceptional meeting of the Spearfish Area Historical Society, blending the dramatic arts and a bit of area history. 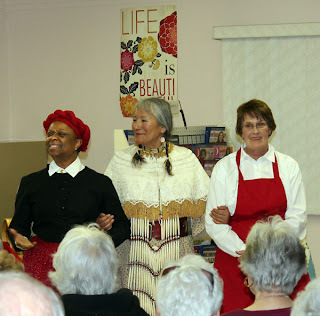 With support from the South Dakota Humanities Council, performers Joyce Jefferson, Lillian Witt, and Belinda Faye Joe-Rencountre did a splendid job in capturing and holding the attention of society members. 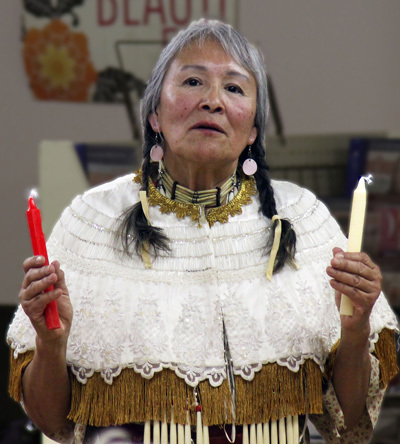 Each performer researched and wrote her own part for this poignant historical interpretation of the events leading up to the Wounded Knee massacre in December of 1890. The veteran member of this group, Joyce Jefferson, played Mattie Elmira Richardson, engaged to one of the Buffalo soldiers stationed in Dakota Territory. Lillian Witt portrayed Sadie Babcock, a rancher's wife. And Belinda Faye Joe, in her first performance with Dakota Sisters, played Waste' Win, Lucy Lone Eagle's friend. The fast-faced seven-act performance reached back to the mid-1800's, before gold was discovered in the Black Hills, to a time in the 1860's when the Hunkpati Dakota tribe was forcibly removed from their Minnesota homeland and relocated to Dakota Territory. That's where Waste' Win began her story of the harsh winter in the stockade at Fort Thompson. It was the days when Sadie Babcock and her husband and three children arrived in the territory in Texas -- ready to partake of the "free land" offered by the government. And as the Civil War was ending, Mattie Elmira Richardson and her family were just freed from slavery. Mattie became engaged to Siscro McCarty, a Buffalo soldier assigned to the Ninth Cavalry in Dakota Territory. The dramatic interpretation led the audience through the era of the battle at the Little Big Horn and the shifting attitudes of the different cultures in the plains. Mattie and her family moved from the south to Nicodemus, Kansas, and she shared one of Sisco's letters with the audience. In the 1880's, Sadie Babcock befriended Lucy Lone Eagle, while Mattie Elmira pursued her education in Kansas and worked to earn money so she could join Siscro in Dakota Territory. The 1880's ended in the region with a significant drought. Waste' Win makes friends with Lucy Lone Eagle, and Lucy shares stories of their journey and plight with Wast' Win. Trooper Siscro writes to Mattie and describes the Ghost Dance religion and life on the reservation. November and December 1890 bring more bad times beyond the drought. By this time, Mattie has become a maid for the Babcock family, and she reads a letter from Siscro, who tells about his cavalry unit being dispatched from Fort Robinson in Nebraska to Pine Ridge. News comes that Sitting Bull was killed by tribal police, and in late December, Lucy Lone Eagle, her tiospaye, Big Foot and their band, arrive at Wounded Knee Creek. Near starvation, they meet their fate in a massacre on December 29, 1890. Dakota Daughters shared introductions and acknowledgement of prayers, songs and candles to represent ancestors, healing, light, and life. You'll find more photographs from this inspiring program in our SAHS Photo Gallery. While the Humanities Council encourages discussion following these performances, there was very little following this dramatization, but there was a stirring round of applause for the ladies portraying the Dakota Daughters, for their performances and their display of hope -- a recognition that Mitaukuye Oya'in: We are all related. The final program for the Spearfish Area HIstorical Society is scheduled for Tuesday, May 7, when Guy Edwards and Paul Higbee will tell the story of the Mickelson Trail…from the Beginning.